Learn how to draw the basic shape of things and the outline / contour of your subjects / model with the following drawing tutorials for teaching kids to draw and for anyone else who wants to learn. When you were a child, you learned how to draw by drawing everything in a flat-like fasion. For example, you drew trees as a line with squiggly lines at the top...you drew a house as a triangle and a square. 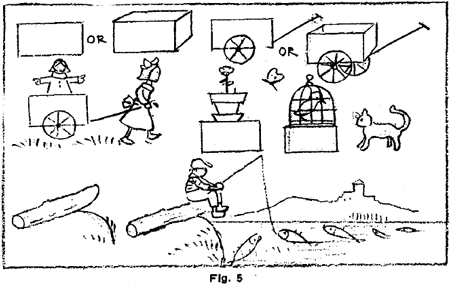 Nothing had depth to it, because children see objects as basic shapes inside their mind. When you first learn how to draw, it is best to start drawing flat drawings...that is to say, the front faces of the objects presented. This is how children learn how to draw, and this is the right way to do it. Many times, even this is difficult for the child or the beginner artist, but the examples and simple directions on this page should help you overcome your obstacles to drawing. Follow these directions to see if it helps you draw. Now lets draw another picture in the same way. How about a house from the front point of view. 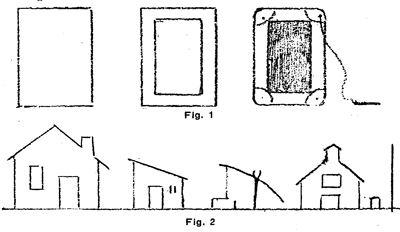 Then after you draw this, add an adjoining shed, a well, maybe a barn (look at figure 2). To draw the entire subject in a simple way, draw a horizontal line as a base line for all the buildings ... as if it is the land / grass below the house. Kids might now understand what parrallel lines are at a young age...they haven't been taught this yet. So if you are teaching a child how to draw, instead single line examples are giving on this page instead. 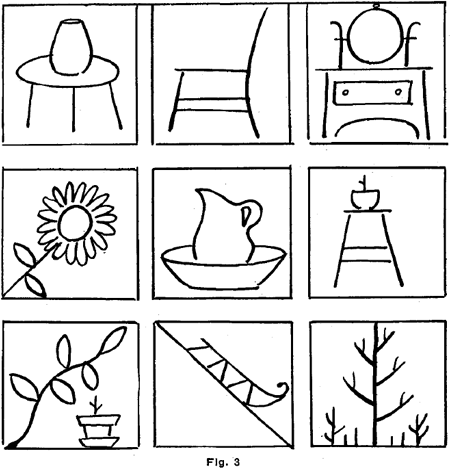 As an exercise to help you learn how to draw(or to help teach the kids that you are teaching to draw) , have all the kids draw familiar household objects around the classroom or classroom...and then have them enclose each object in a square. 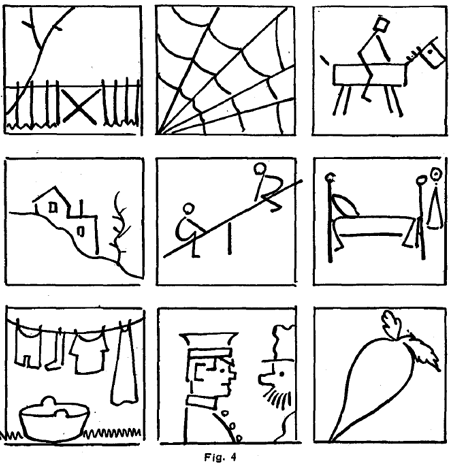 Below are some examples of what you might decide to draw and what we mean by easy objects with single lines. Drawing Objects and Figures from Your Deep Imagination. The following drawing exercises found below will help develop your imagination. The subjects and objects below are to merely be suggestive...obviously you can incorporate subjects that you want to...in this case, just ignore our suggestions. Care should be taken to select objects simple in outline and construction. Just draw the front of a box. Now add wheels and a handle as well, thus making a wagon out of it. Can you now draw a baby doll in the wagon? Can you try to draw a boy or a girl pulling this wagon? Now Write a description of this drawing right underneath it. Try to be descriptive, for example, write about where the kids are taking the wagon. Now Draw another box. Right in front of the box, draw a flower pot on top of it. Now put a long stem with a flower inside of this flower pot. Now you can sketch out some leaves on the stem. Now place a butterfly or a bird flying near the flower. Write another caption or description underneath this drawing. Maybe write about birds and flowers and why they are there. Draw the box yet again...then place a bird cage on top of it. It might sound hard to do, but from your imagination, try to draw a bird within the cage. Draw a kitty cat near this drawn box. He can be looking at the bird that is in this cage. The cat is very fond of the bird because he looks so tasty to him. Try writing a caption from the kitty cat's point of view...what does he think about this bird? Now, still using figure 5 as a reference, draw a log on a river bank and put a child on this log. Now draw a fishing rod in this child's hand...one with a fishing line and hook. Now draw a water line where the surface of the water would be. Now draw a fish under the water line, getting ready to bite at the fishing line's hook. Can you write a story about this picture or at least write a caption from the fishes' point of view. Lines in different directions and angles could mean very different things. For example, a coffee cup with wiggly lines coming out of the top of the coffee cup would mean hot coffee...however, sideways lines coming out of the back of the coffee cup would mean racing fast coffee cup, speeding away...so as you can see, different lines can mean different things. By combination of different lines, and the angle of them, we are enabled to establish the meaning of lines that by themselves would not be recognized in the way we intended them. For instance, the lines in the upper left hand corner of figure 6 would not be understood as representing rain. But place an open umbrella in connection with the lines, and the eye interprets them as portraying rain. For practice, draw plain lines on paper and then add figures as here suggested. Now Draw on the paper, the lines that you see in Fig. 7, Box A...you would have to guess what they mean...but add a boat and you turn the lines around and it looks like waves. The scallops, by themselves, represent nothing in nature. But if you invert them and place a sketch of a sailboat in the drawing, then waves are suggested in the drawing instead. 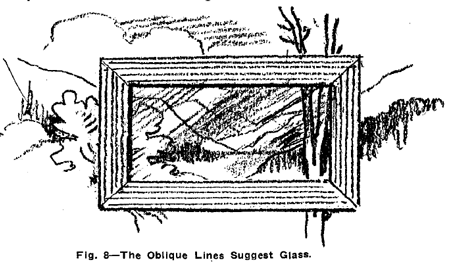 The lines inside the frame, by themselves, would hardly be recognized as representing glass, but draw objects beyond, partly hidden, and the meaning becomes clear.